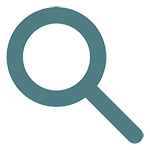 Over 800 examples showing how our guidance and standards can improve local health and social care services. Ideal if you're responsible for making changes to service delivery. 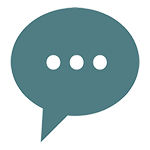 Tell us how you've made improvements in your organisation. 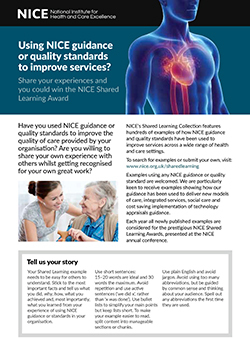 Get shortlisted for the annual NICE Shared Learning Awards. The deadline for the 2019 Shared Learning Awards has passed. New submissions will be considered for the 2020 awards. These show how NICE guidance and standards have been put into practice by a range of health, local government and social care organisations. declare any third party sponsorship. We check that they are in line with our recommendations and quality statements. Examples are written by the submitting organisation and shouldn't be interpreted as our formal endorsement of the approach taken. Each year we pick a selection of shared learning examples that deserve special recognition. The awards are presented at the NICE Conference. The deadline for the 2019 Shared Learning Award has passed but we accept submissions all year round. New examples will be eligible for the 2020 award. See last year's shortlist and our previous winners and finalists. 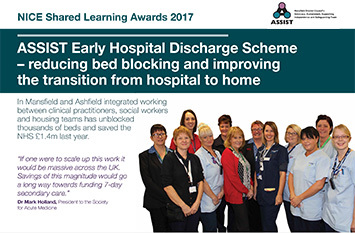 Since our shared learning example was published we have been contacted by many centres from around the UK, allowing us to share our project and learn from others. 2016 winner Dr Emma Greig – Consultant Gastroenterologist, Somerset Gastroenterology Flexible Healthcare Team.